The number one cycle race in the calendar of the Sri Lanka Cycling Federation, the “Guwan Hamuda Papedi Sawariya” will be held from February 25 to 27. The complete distance of this three day event is 442 Km. 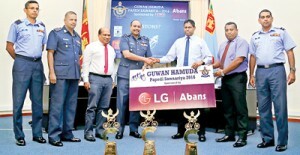 “Guwan Hamuda Papedi Sawariya” is being conducted for the 17th consecutive year and will conclude with the 65th Anniversary of the Sri Lanka Air Force. 150 local men’s riders and 50 women riders are expected to take part in the event. Overall winners will be in line for handsome cash awards amounting to Rs.1.4 Million. Four foreign countries too have been invited for the event. Already Pakistan and Bangladesh have confirmed of their participation while India and China are expected to confirm their participation this week. Sri Lanka Air Force is doing yeoman service to cycling by conducting such races. They have also taken in first class riders to the SLAF and the fastest rider in South Asia Jeevan Jayasinghe is also from the SLAF. This year Jeevan bagged two Gold Medals in cycling at the just concluded South Asian Games in India. This was stated by the President of the Sri Lanka Cycling Federation President Dr. Amal Harsha De Silva at the press briefing. At the press conference at the SLAF Headquarters SLAF Cycling Chairman Air Vice Marshall D.L.S. Dias stated that this was Sri Lanka’s number one cycling event. This cycle race is exclusively sponsored by Abans Group of Companies. Abans are sponsoring the event for the 10th successive year. The objective of the race is to offer an opportunity to the cycling fraternity to take part in a competitive event and to promote the sport in Sri Lanka. This race is ranked at National level and conducted under the auspices of the Cycling Federation of Sri Lanka (CFSL) over one hundred male and thirty female Sri Lankan ranking/other riders registered with the CFSL are expected to compete in this race.The duration of the race will be for three days. It will start on February 25 2016 from Colombo passing through Ambilipitiya, Weerawila , Koggala and finish in front of SLAF Station Colombo. It will cover a distance of 442 Km on the first day. The men’s race which will commence from Colombo will finish at Ambilipitiya (178 Km). On the second day the race will start at Weerawila and finish at Koggala (131 Km). On the final day the race will start at Koggala and will finish in front of Air Force Headquarters, Colombo(133 Km. In addition to the men’s race a women’s race is scheduled to commence on February 27 from Ekala, Air Force base and will end at the SLAF Headquarters in Colombo Fort. Distance 65.8 Km. In keeping with the tradition of “Guwan Hamuda Papedi Sawariya”, for the year 2016 Race too, the organisers plan to give away handsome cash awards for Individual and Group winners amounting to more than Rupees 1.4 Million. Rs. 200,000.00 and prizes up to 25th place. The final awards ceremony will be held at the Rifle Green grounds at SLAF Headquarters at 5 pm on February 27 where the Commander of the Sri Lanka Air Force Air Marshall Gagan Bulathsinhala will be the chief guest.